Mr. Castellanos is a strong advocate for employee rights who understands that problems in the workplace can create some of the most troubling times in a person’s life. Mr. Castellanos works tirelessly to ensure that justice is carried out for each of his clients. He represents clients in both state and federal courts, as well as various administrative law hearings and unemployment disputes. Mr. Castellanos’ practice focuses on representing employees, both private and public, against employers in discrimination cases. He also focuses on unpaid wages claims, unpaid overtime claims, whistleblower claims, and contractual disputes. Mr. Castellanos is a graduate of the University of Texas School of Law. During law school, Mr. Castellanos focused his studies on labor and employment law. Mr. Castellanos participated in the Transnational Worker Rights Clinic, which helps low-income workers recover unpaid wages. Mr. Castellanos also completed a summer internship with the Texas RioGrande Legal Aid’s employment department. 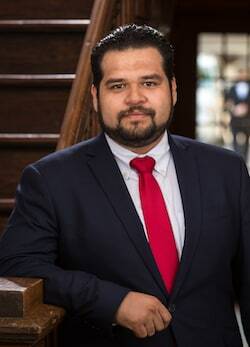 While in law school, Mr. Castellanos also gained invaluable legal research and writing experience by serving as the Editor-in-Chief of the Texas Hispanic Journal of Law and Policy. Mr. Castellanos has demonstrated a strong commitment to fighting for social justice and giving back to the community by participating in various pro bono activities throughout his law school career. Before attending law school, Mr. Castellanos graduated from the University of Nevada, Las Vegas with a bachelor’s degree in political science. Mr. Castellanos participated in various mentorship programs that assisted at-risk youth, assisted in the administration of a federal program that was aimed at finding jobs for low-income individuals, and was involved in a program that helped low-income high school students continue their education. Mr. Castellanos is honored to have the opportunity to serve Texas workers in their employment disputes. Mr. Castellanos looks forward to continuing his fight against social injustice in Texas. Mr. Castellanos is licensed to practice law in Texas. He is admitted to practice in the Eastern, Northern, and Western Federal District Courts in Texas, as well as Texas state courts.